This article first appeared in 2002 on the 100th anniversary of Enrico Fermi's birth. One of the highlights at Argonne's "Symposium Celebrating the 100th Birthday of Enrico Fermi and His Contribution to the Development of Nuclear Power" in 2002 was a stream of Fermi stories from his colleagues and admirers. On Dec. 2, 1942, after Fermi's team had successfully achieved history's first controlled nuclear chain reaction, Arthur Compton placed a brief phone call to James Conant, chairman of the National Defense Research Committee. The conversation was in code, though not a prearranged one. Compton: "The Italian navigator has landed in the New World." Conant: "How were the natives?" Enrico Fermi works with an electronic control for a neutron chopper during his Argonne days. … [O]n the morning of Dec. 2, as the control rods were pulled out to approach criticality, Fermi was checking at each stage whether the distance from criticality was what he expected. He didn't approach criticality until he was satisfied in all respects that the pile was behaving exactly as he had predicted. So it wasn't any accident for him. It was something that he had well planned and thoroughly orchestrated, and was really a beautiful example of how to combine theory and experiment. Volney Wilson was a member of the Fermi-led team that created the world's first controlled nuclear chain reaction in a squash court at the University of Chicago's Stagg Field. Wilson is credited with coining the use of the word "scram" for the sudden shutdown of a reactor. All over the world, reactor control panels have emergency shutdown buttons labeled "SCRAM." One often-heard story holds that the term is an acronym for Safety Control Rod Ax Man, an homage to Norman Hilberry, Argonne's second director, who stood poised with an ax during the start-up of the first reactor, ready to cut a rope and release the control rods that would stop the reaction should all else fail. But during the break after the symposium's first panel, Wilson laid this myth to rest. He said that he and Wilcox Overbeck were working in the squash court where the reactor was under construction while an electrician wired the control panels. The electrician finished wiring the red emergency-shutdown button, turned to them, and asked how he should label it. According to Wilson, Overbeck responded by asking, "Well, what do you do when you push the button?"" And Wilson replied, "You scram out of here as fast as you can." The Enrico Fermi stamp was issued on the 100th anniversary of Fermi's birth – Sept. 29, 2001. 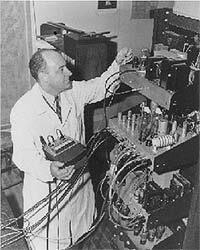 At Alamogordo, (Fermi's) determination of the test bomb yield is a classic example of his deep understanding of physics and his simple approach to meaningful experiments. He was about nine miles from the bomb. After the detonation, he began dropping small bits of paper to the ground. When the pressure wave arrived several seconds later, the bits of paper no longer fell directly to the ground, but were displaced. He measured the distance of displacement with a simple ruler and within seconds had calculated the energy released by the bomb. There were, of course, very sophisticated devices to do this with lots of wires and recording instruments that were interpreted later. But Fermi's measurement was well within the range of those … as he read from a table he had prepared relating displacement to energy released. I want to mention the "Fermi Questions." Fermi was the first physicist to my knowledge who enjoyed doing physics out loud walking through the hall. … We were walking though the wooden barracks-like structure of the Theoretical Physics Building at Los Alamos, and as we walked, the sounds of our footsteps reflected off the high surface - wood, no acoustic treatment - and seemed to bounce throughout. And he said, … "How far do you think our footsteps can be heard in this building." And then he began to tell me what the yield of sound would be from the impulse, how far that would go, how you have to worry about the wood conduction and the air passage. And pretty soon, by the end of the hall, he had [an answer]. It was a fast calculation. Sounded very reasonable. And when I tried to recalculate it, I got something like the same result - slowly and looking at the numbers over and over again. This was my idea of a Fermi Question: Turn every experience into a question. Can you analyze it? If not, you'll learn something. If you can, you'll also learn something. The rumor was that when Fermi got his copy of Physical Review, he would first read the abstracts to see what the problems were. Then he worked out the solutions, and finally read the articles to see if the authors got it right. Rose pointed out that the story is probably apocryphal, though some of the panelists had also heard it. 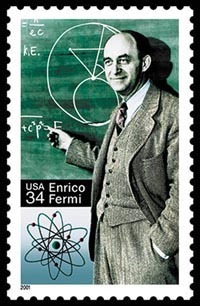 But even as a myth, it illustrates the high regard the entire scientific world holds for Enrico Fermi. In the course of this work (using neutrons to induce radioactivity in various elements), Fermi and his group noticed a "boundary effect," I guess they called it, which was that if they did the experiment on a marble table then they induced a certain amount of radioactivity, but if they replaced the marble table by a wooden table, the neutron radioactivity increased a hundred fold. Then Fermi, over lunch, according to [Nobel Prize winner Hans] Bethe, … figured out that … the neutrons were slowing down because of the hydrogen and the light elements in the wood. And this is how Fermi established the great power as an experimental tool of slow neutrons. Atoms Forge a Scientific Revolution - A series of articles covering Argonne's nuclear energy legacy from the first nuclear reactor to the present.